We’d love your help. Let us know what’s wrong with this preview of Gulliver's Travels / A Modest Proposal by Jonathan Swift. By turns a children's fantasy and a social satire for adults, Gulliver's Travels is one of the most popular adventure tales of all time. "A Modest Proposal," also an imaginative, enduring work, is political lampoonery at its finest. To ask other readers questions about Gulliver's Travels / A Modest Proposal, please sign up. Is there a magic carpet in Gulliver's Travels? Swift is a fan-freaking-tastic satirical writer. A Modest Proposal was hilarious, so long as you understand it is indeed a satire. Gulliver's Travels is also satirical, and I found it fun tying the satire back to what was going on in politics when Swift wrote this. Even if you don't understand how the piece is satirical, you can still gather the themes and lessons throughout. Worth a read for sure! I really had to read this about three times to get the whole political underscore and social commentary. When you're 8 years old, it just seems like a fun fairytale, but reading it multiple times in high school and college, it struck different chords each time. It's actually a pretty smart critique on life dressed up in an interesting bunch of journeys to different lands. A Modest Proposal, was hilarious, in my opinion. Reading it once as-is and then again keeping in mind the satirical nature of I really had to read this about three times to get the whole political underscore and social commentary. When you're 8 years old, it just seems like a fun fairytale, but reading it multiple times in high school and college, it struck different chords each time. It's actually a pretty smart critique on life dressed up in an interesting bunch of journeys to different lands. This book is SO much more than Lilliput. I'm glad I read the entire book, rather than relying on Disney's version. Eh...I picked up Gulliver's Travels because I brought back from Christmas holiday (my parents' home and residence for many of my books) with the intention of diving right into it in January. Obviously, the intention has gone stale as it is now July. Gulliver's travels reminds me of Twain's Innocents Abroad. Both are travel narratives and not really "novels" in the traditional sense--if at all. Swift and Twain's works are also united by their satirical intentions, though I must admit that much of Eh...I picked up Gulliver's Travels because I brought back from Christmas holiday (my parents' home and residence for many of my books) with the intention of diving right into it in January. Obviously, the intention has gone stale as it is now July. Gulliver's travels reminds me of Twain's Innocents Abroad. Both are travel narratives and not really "novels" in the traditional sense--if at all. Swift and Twain's works are also united by their satirical intentions, though I must admit that much of the satire laced throughout Gulliver's Travels was lost on me. And it also sort of reminded me of "The Odyssey" by Homer--I don't know if this is a comparison most would agree with--but the way each of Gulliver's journeys evolves reminds me of "The Odyssey" where Odysseus is faced with certain tasks in an effort to prevent his return home. 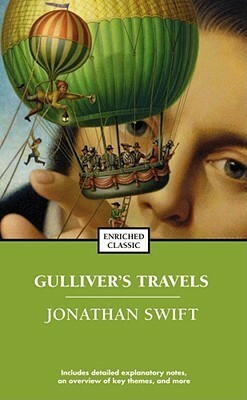 "Gulliver's Travels" is divided into four parts; each part details a separate journey from Gulliver. Gulliver's Travels is purported to be a classic and a children's tale. I read this to find out about both and to remove the Disney version from my head. Gulliver travels to Lilliput (The small), Brobdingnag (giants), Laputa (thinkers) and Houyhnhnm (horses). The small and large are contrasted to show that might makes the rules. The thinkers are characterized an nonsensical, useless, layabout tyrants and the horse society with its attendant Yahoos (feral humans) as the ideal. The ideal which has Gulliver's Travels is purported to be a classic and a children's tale. I read this to find out about both and to remove the Disney version from my head. Gulliver travels to Lilliput (The small), Brobdingnag (giants), Laputa (thinkers) and Houyhnhnm (horses). The small and large are contrasted to show that might makes the rules. The thinkers are characterized an nonsensical, useless, layabout tyrants and the horse society with its attendant Yahoos (feral humans) as the ideal. The ideal which has no crime, want disease or love seems kind of boring. The writing is arachaic, profane, funny and tedious. A Modest Proposal in the darkest humor advocates the eating of Irish children by English lords and ladies. It would relieve the overpopulation of Ireland and play to the strength of the Irish - procreation. Swift acknowledges the slight initial distaste of eating children, but he suggests several methods of preparation and repitition to overcome the qualms of the sqeamish. I thought this, being a classic, would be better. It was exciting at first to read about his experiences in a strange land, but after awhile, all I could think was, "Geez guy, just stay home with your wife and kids. Every time you leave on a ship you inevitably are shipwrecked or thrown overboard or mutineered. LEARN YOUR LESSON!" But he doesn't. Maybe it's just that the stack of books on my nightstand seem WAY more interesting that Gulliver's Travels. But it wasn't engaging for me. :( Sadly, I I thought this, being a classic, would be better. It was exciting at first to read about his experiences in a strange land, but after awhile, all I could think was, "Geez guy, just stay home with your wife and kids. Every time you leave on a ship you inevitably are shipwrecked or thrown overboard or mutineered. LEARN YOUR LESSON!" But he doesn't. Maybe it's just that the stack of books on my nightstand seem WAY more interesting that Gulliver's Travels. But it wasn't engaging for me. :( Sadly, I think the Jack Black movie might be more engaging. I do love Jack Black though. Vive Nacho!! Swift had a political agenda when he wrote Gulliver's Travels, and I find it fascinating how he could weave a plot around his opinions, to create an analogy that anyone can understand (and find humor in). As a result, he created not just an avenue for his social opinions, but a new literary culture (ie - the original source for our term "yahoo"). If you have never read "A Modest Proposal" I highly recommend it. Swift mocks some of his contemporaries and their methods for solving social problems, Swift had a political agenda when he wrote Gulliver's Travels, and I find it fascinating how he could weave a plot around his opinions, to create an analogy that anyone can understand (and find humor in). As a result, he created not just an avenue for his social opinions, but a new literary culture (ie - the original source for our term "yahoo"). I stayed up until 11:37pm last night, finishing it, so I wouldn't have to endure such misery any longer. Basically: The book is terrible. It was a good idea, I could see the potential, but the author ruined it with all the crudeness and unpleasant descriptions of some things. And also the part in which he basically goes insane. Maybe a retelling is in order. In a slightly more modern, or slightly more ancient setting. Possibly with time traveling. And dragons. And more pirates. Hush, I can't! Be quiet! Gah! Akin to an 18th century version of Monty Python, Gulliver's Travels uses satire to examine the trends and beliefs of its day. Unfortunately, as someone else noted, only historians are likely to understand the satire in the first two books. The third book, however, is easily understood by a modern reader, and provided a number of laughs. The fourth book, while clear to a modern reader, is the least interesting of the four. A Modest Proposal, like the third book of Gulliver's Travels, also stands t Akin to an 18th century version of Monty Python, Gulliver's Travels uses satire to examine the trends and beliefs of its day. Unfortunately, as someone else noted, only historians are likely to understand the satire in the first two books. The third book, however, is easily understood by a modern reader, and provided a number of laughs. The fourth book, while clear to a modern reader, is the least interesting of the four. I had to read these for my British Literature class. Gulliver's Travel's was intriguing and interesting. A little bit of fun and fantasy was refreshing to read. A little adventurous, and a new learning experience for a traveller. I much enjoyed reading A Modest Proposal so much more! The satire is hilarious. It's written so matter of fact, yet with undertones of humour and hilarity. Jonathan Swift is a great satirist. Jonathan Swift took some literary swings at humanity. "...For they have no conception how a rational creature can be compelled, but only advised, or exhorted; because no person can disobey reason, without giving up his claim to be a rational creature." The beautiful and noble Houyhnhnms were, of course, my favorite characters. This book seemed to be nothing more than the drunken rantings of an Irish man. It was a good book, but it was very strange and weird. "A Modest Proposal" was by far the funniest thing I have ever read though. It is dripping with satire and just absolutely hilarious. Anyone who takes it seriously is seriously an idiot, because there's no way it could even be considered as a real proposal. A wonderful collection of fantasy worlds and adventures on the surface with deeply satirical observations about human nature below. There is a reason people are reading this after all this time. I also enjoyed "A Modest Proposal", but warn anyone who reads that about the satirical bent to all his works - he doesn't mean what he says on its face value, so read between the lines. I found this book pretty fascinating because I wonder how one day you'll be a normal size and the next day you wake up and you're a giant. I would not even want to be a giant because I am already tall and I would not like to be seen as a person who steps on people. This book strangely reminds me of big feet. I was severely disappointed by this book. Based on its reputation I expected so much more. The story was boring. Of the four parts, the third was the most interesting. While some of his satire on the failings of man are entertaining, the satire on the political scene in late 17th, early 18th century England just aren't that interesting. It took me a while to remember this book, but it was magnificent. Swift was so darn clever and snarky. I love snarky political commentary that is aimed not just at poking holes in our pretensions but challenging us to be better. Swift was one of the earliest and still ranks as one of the best. Gulliver's Travels was a great story of adventure I read as child. I didn't come to understand the political satire until I started college. My college experience has enriched the reading experience for me and I can appreciate the book on a different level. Lewis called Ovid a "cheerful old degenerate" and at the risk of making an oxymoron, I think Swift is a cheerful old misanthrope. The journeys read quickly and completely avoid melodrama, the irony is supurb, and it is genuinely hilarious. I am re-reading this classic book because it is hard to get free e-books for my iPad from the library. I use a few classics in between when I have problems getting newer books to read. I am understanding the satire much more as an adult than I did as a young adult reading required reading. Who doesn't love great satirical writing?! There's a reason these works are in every English Lit. anthology I've ever seen, and I've seen a lot! This book is about so much more than little people. There is a deep sadness under it all. Perhpas I should try to read this with adult eyes. However, I HATED Travels in high school. Modest Proposal was okay though.